There is only one thing happening in the United States this week: The Superbowl. Everything in media and culture has been leading up to this Sunday when the New Orleans Saints will play the Indianapolis Colts for the World Championship of Football. Yes, this is the kind of football not played by the feet, but its Football here. And as far as we are concerned, like the World Series in Baseball, it is the "World Championship" of the game even though no other Countries were invited to play. This is Superbowl XLIV. (seems more Official in Roman numerals) Yes. We have been doing this for 44 years! When it comes to the big game it is not about who wins- because by this time only two cities are left and the rest of the country's teams have been eliminated - so we don't really care. It is not about the game, it's about the event. 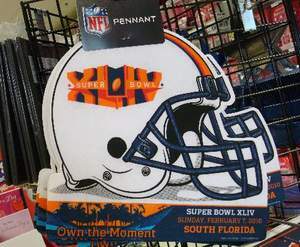 The Superbowl event this year is in Florida. The location for the game is awarded years in advance so the organizers have plenty of time to make it, well, Super. They spend millions but they make billions. It's a huge boon to the economy and cities fight for the chance to host this event. I won't be spending money to travel to Miami or buy tickets to the game because it's pretty much impossible for a 'regular' person to attend the game. The tickets are long gone to the NFL (National Football League) and corporate sponsors. These tickets are for big wigs and celebrities. You don't get one unless you are 'somebody'. The attendees of this game have the highest per capita income of any event, anywhere. IF you could manage to get a $200 ticket it might cost (in a package) about $7,000. Corporate fat cats compete to get A-listers to their private Suites and we get reports of what Stars and celebutantes were at which Superbowl parties. Again, we don't care because it's not about the event in Florida it's about the food in our living room. 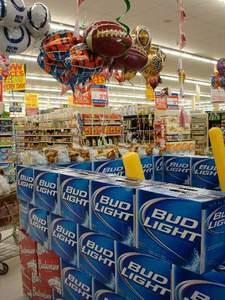 True, Superbowl Sunday ranks second to Christmas with the amount of food consumed in America. It actually beats out Thanksgiving- another Holiday dedicated to eating and watching (College)Football. 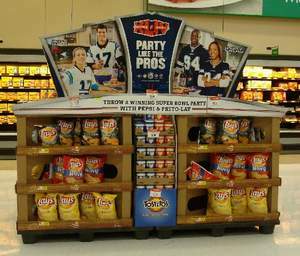 Along with specials on flat screen TV's and deep fat turkey fryers the focus of every supermarket, bar and restaurant in town is about the Superbowl Party: groceries, beer, trays or catering. We are in full-tilt junk food prep mode. Gameday food is tortilla chips and salsa, Bar-B-Q babyback ribs, burgers, brats and Buffalo hot wings. 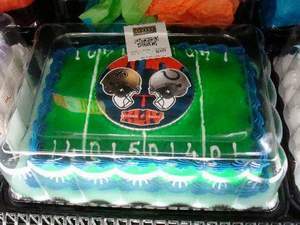 Bakeries have cupcakes in team colors and cakes in football and helmet shapes. There are store specials on everything from poultry to produce, especially avocados. Apparently we eat a LOT of guacamole. Over half the avocados consumed annually the US (80 million pounds!) are sold the week leading up to Superbowl. Chips and guacamole combine to make another football food and one of our national treasures: Nachos! Here in the American Southwest we are Nacho experts so all kinds of Mexican food makes it to our Superbowl menu: tacos, quesadillas, green and red chili. We are blessed with great weather in February so as the rest of the country freezes we will be grilling outside. Make no mistake, even though the Arizona sun is shining we will bring the food back inside and hole up in a dark room all day watching TV. We have a lot of time to eat during the game. With the pre and post game programming you are looking at a minimum of 6 hours of couch time. We spend it all eating, drinking beer and ignoring the game. If something actually happens we catch the instant replay. American football is designed in stops and starts and we don't have any problem with "TV Timeouts". We also watch the commercials. Superbowl ads are part of the event. Companies roll out their best ads and America waits for them...we also have re-cap show just for the commercials and we debate and vote on our favorites. Superbowl ads are as famous as the game and advertisers lined up to buy them at this year's discounted rate of only $3million for :30 seconds. And why not. We are all here at home eating and watching. Superbowl Sunday is not really a Holiday. (it just seems like one) There will be few cars on the street and no one in the stores or parks. It is a great time to go to a hardware store! Guys are at Sports bars or home in their "Man Caves" taking the day off to watch a game they don't care about, relax and eat. We Americans don't have that many National Holidays but the Superbowl is one that was one we sort of designed ourselves, by the people, for the people...we love it! The domestic TV audience was roughly 100 million. British Superband THE WHO (led by pensioners Pete Townsend and Roger Daltrey) rocked the crowd in the half-time Show. ... and our Kelly only gained 3 pounds.